I’ve been in a cozy mood this week with the darker mornings and drizzly days. The tips of the maple leaves on the tree outside my window are tinted red. Autumn is truly here and I’m embracing it. One afternoon, after doing some chicken chores in the wet backyard, I glanced at a bowl of Italian plums sitting on the kitchen counter and my thoughts turned to jam. 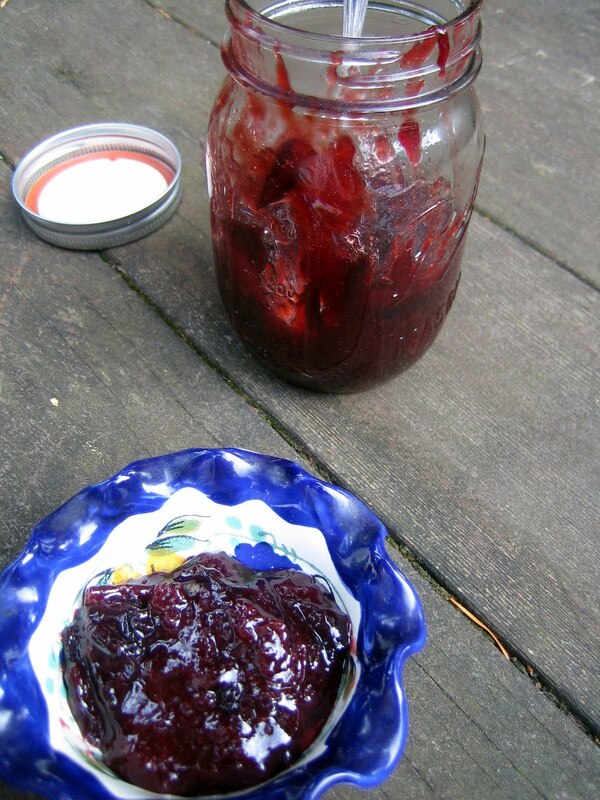 Making jam is a homey task, right up there with kneading bread. I felt chilled from the damp air and a bubbling pot on the stove sounded very appealing. After chopping the plums and stirring them together with sugar and lemon juice in a sauce pan, I pulled a bottle of bourbon from the liquor cabinet and added a couple of healthy splashes to the mix. The kitchen filled with a pleasant, plummy, boozy scent and I inhaled deeply as I stirred. Not a bad way to pass the afternoon! The skins of the Italian plums turned their yellow flesh a rich, deep purple. Before half an hour had passed, I had a luscious pot of jam (and a burned tongue from taste testing!). I waited impatiently for the jam to cool. I had picked up a loaf of bread on impulse that morning (studded with pears, hazelnuts and figs ... you understand these impulses) and I was dying to try a slice with the jam. Then I spied mascarpone cheese in the fridge and the afternoon got even better. I was swooning and licking my fingers. Thick slices of bread (remember the pears, hazelnuts and figs), a generous spread of mascarpone cheese and a big scoop of plum jam to top it off. Heavenly to indulge in, especially while sipping tea and looking out at the mist turning to rain. Combine all the ingredients in a medium sized sauce pan. Bring to a boil, then lower heat and let simmer rapidly for about half an hour, until the mixture thickens and looks jammy. Stir the jam often to prevent sticking. When cool, ladle into a 1 pint Mason jar. Jam will keep for 1 month in the fridge (but it won’t last that long!). Yummy! You've reminded me I've got bramble jelly to make for next week. Oh I love pretty much anything with bourbon, unless it's just bourbon by itself. This looks wonderful, and your story just makes me want to make it! It's pretty gloomy, and drippy, and Fall-y on this side of Lake Washington, too! Thank you, Chez Suzanne! I do enjoy Tom's posts...such a great column. 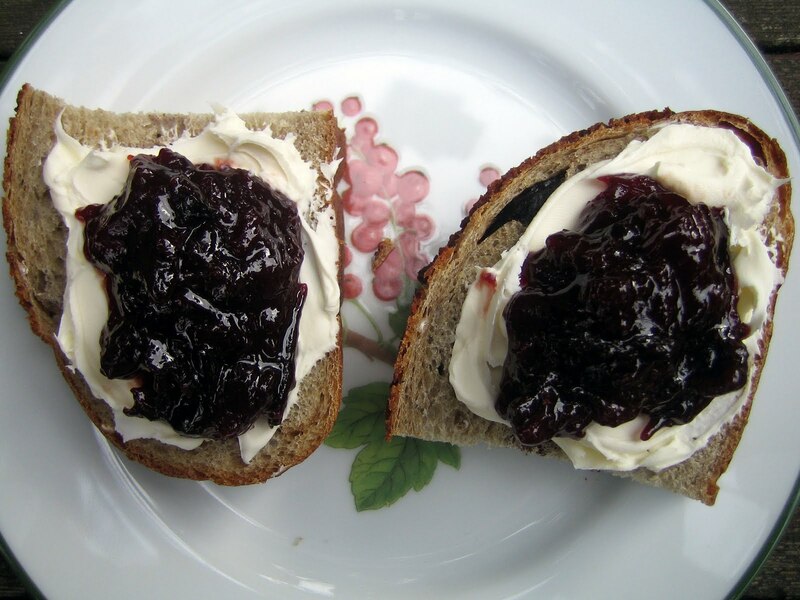 I love all the varieties of plum jam you can make. I'm sure your first one must have been lovely! Thank you, B! I hope you enjoy the jam. The sun is pearing out here now, so I hope it's the same for you. Wow wow wow! I need to make this asap. That bread sounds amazing btw! And with mascarpone - sigh. Just lovely. This is lovely Hannah...I just love the touch of bourbon! I like how you know that these things don't need the long canning process because we eat them before they go bad. I'm a sucker for short version of making things but like keeping the quality. Your recipes fit my lifestyle and taste. Thanks for another yummy recipe. Thank you, Katherine! 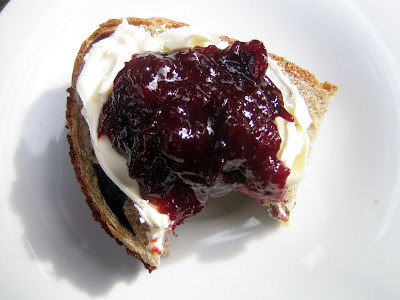 I hope you enjoy the jam (and please try it with some mascarpone and good bread...I ate way more than I should have!). Yum! I like the idea of a spiked version. Thank you, Sara! I hope you enjoy the jam. I'm glad to hear you solved your commenting problem. We recently switched to chrome, too, and it's been much better. I am hooked on the Green Market Baking book and have so many pages tagged. I'm making the maple ice cream tomorrow. Sigh, I may just have to buy it! Yum! And yes I get the exact same impulse for all sorts of bread. The fruity jam with the cool, creamy mascarpone sounds like a match made in heaven.